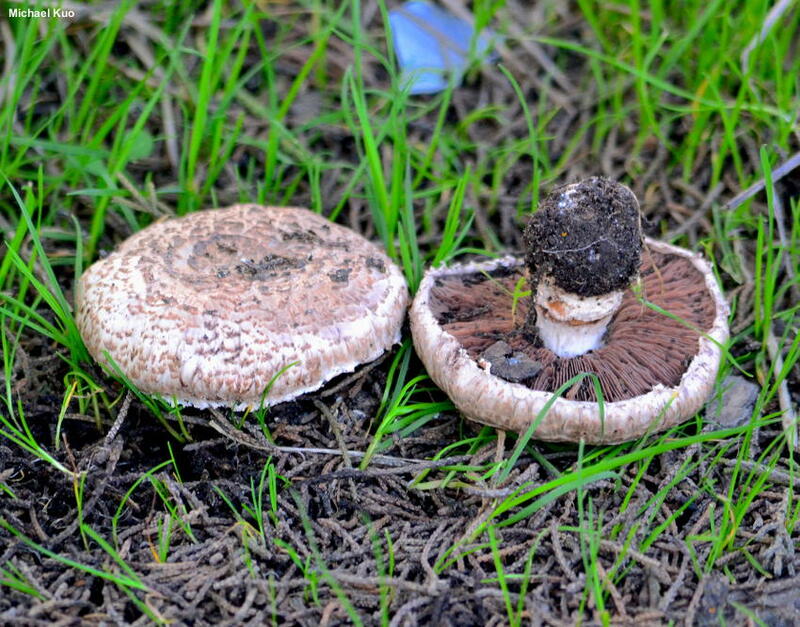 One of several Agaricus species found over winter under California's Monterey cyprus trees, Agaricus pattersoniae features a cap that is covered with small brown scales, flesh that turns pink when sliced, and, often but not always, a brownish ringlet on the lower part of the stem. Agaricus brunneofibrillosus is very similar, and also grows under Monterey cyprus—but its cap features appressed, innate fibrils rather than true scales, its stature is less stocky, and, under the microscope, its spores are smaller. 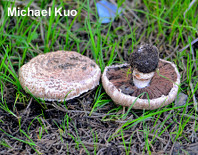 Agaricus pattersoniae was named by Charles Peck (1907) on the basis of a collection sent to him in New York by Stanford students—but in 1979 Agaricus expert Rick Kerrigan determined that Peck had actually based his concept of the species on a mixed collection, combining features of two distinct species. The other species in the students' collection was one Peck had previously named (Agaricus californicus) and which, to be honest, is pretty dissimilar. Maybe old Chuck was just in a hurry that day. Ecology: Saprobic; growing scattered or gregariously under Monterey cyprus; winter; along the California coast in the range of the associated tree. The illustrated and described collection is from San Francisco County. Cap: 5–10 cm; convex when young, becoming convex; dry; dull tan and fibrillose underneath small, dark brown scales; when young with white veil remnants along the margin; the margin not changing color when rubbed. 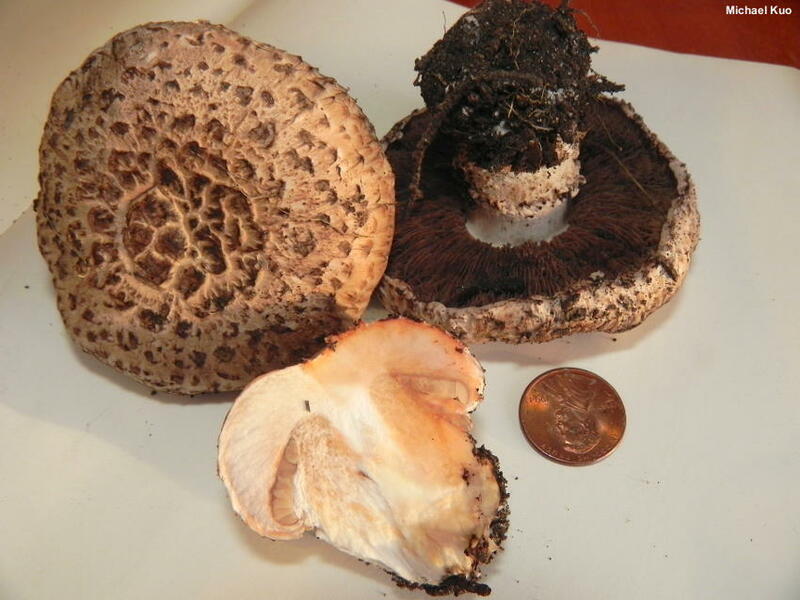 Gills: Free from the stem; crowded; short-gills frequent; whitish to pinkish when young, becoming dark brown with maturity; covered when in the button stage by a brownish partial veil. Stem: 4–8 cm long; 2–3 cm thick; slightly enlarged toward the base; tough; whitish; fibrillose to shaggy; with a collapsing, skirtlike, thick, whitish ring that features a brownish underside; sometimes featuring one to several brown to brownish ringlets near the base. Flesh: White; quickly pink when sliced. 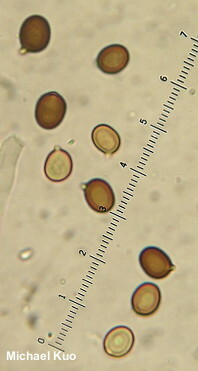 Microscopic Features: Spores: 7–9 x 5–6 µm; broadly ellipsoid, with a prominent apiculus; smooth; thick-walled; brownish to brown in KOH. Basidia 4-sterigmate. Cheilocystidia up to about 30 x 7.5 µm; mostly more or less cylindric and basidiole-like. Pleurocystidia not found. Pileipellis a cutis; elements 2.5–5 µm wide, brown in KOH. REFERENCES: Peck, 1907. (Kerrigan, 1979; Kerrigan, 1986; Desjardin, Wood & Stevens, 2015; Kerrigan, 2016; Siegel & Schwarz, 2016.) Herb. Kuo 01171501.